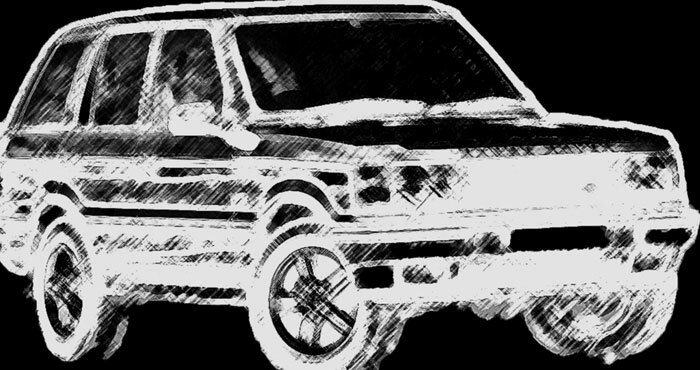 Join my Range Rover P38Group now! Smart phone version of P38 website here! NEW! 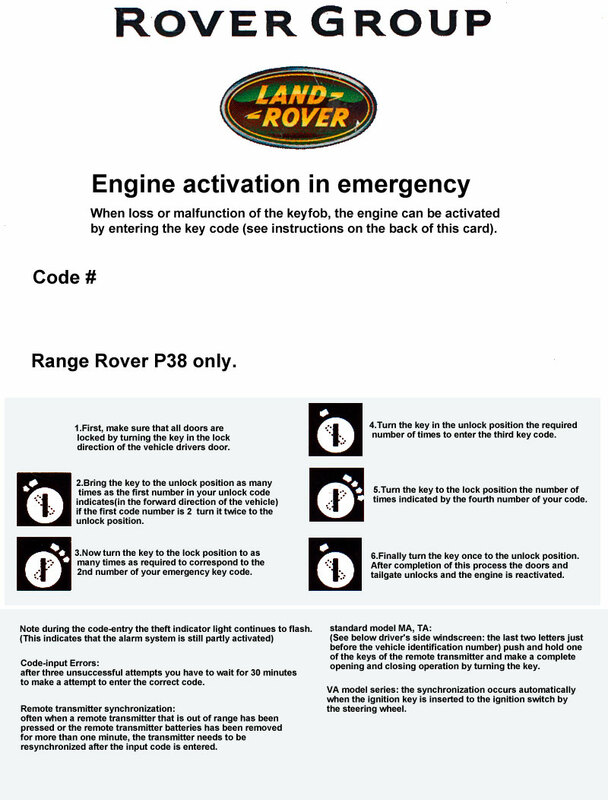 - The Range Rover P38 FREE Classified page! 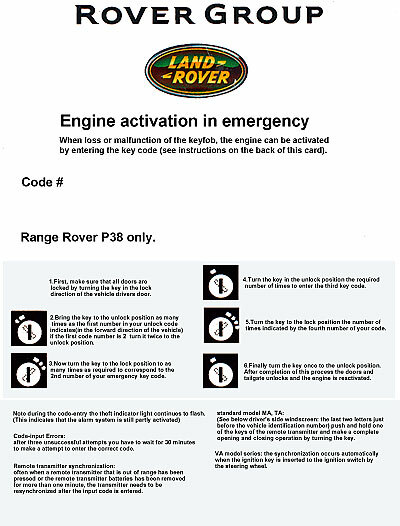 Lost your Range Rover emergency engine activation card? it was in German a language I frankly don't speak at all. That's why I have tried to translate it by the use of some online translation tools and some guessification work. When I was done I felt that I could as well share it with you, so feel free to download it and make a card for your wallet! Please don't be shy if you find anything wrong , just let me know about it so I will get a chance to correct it. Translation Text file download here make corrections as/if required and send it to me please! 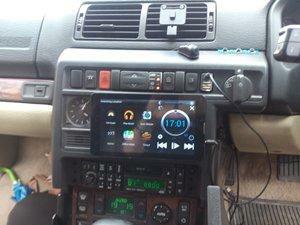 I have started to write a new page for my Range Rover P38 section. temper. go there to read the first part [Relay diagnostics]. I'm in the planing and stage of a dual battery installation for my Rangie. The reason? found my battery drained when I want to take a ride. of many modern vehicles and it did so even in my previous car a BMW. as convenient that I would like to have it. Circuit to the left is the base layout for my dual battery circuit. quite easy problem to cure. tree plastic fasteners that holds the tailgate trim panel. the two screw that are holding the push-button easy in place. Now follow the steps below to dismantle the push-button to clean and adjust it. twist the switch part about a quarter turn to remove it from the push-button body. Now you have four parts on the table, the push-button, body, spring and switch. a way to get in there during a few years of driving. but I didn't so I just used some abrasive paper to remove the worst corrosion. The corrosion was also the main reason why the button was sticky. 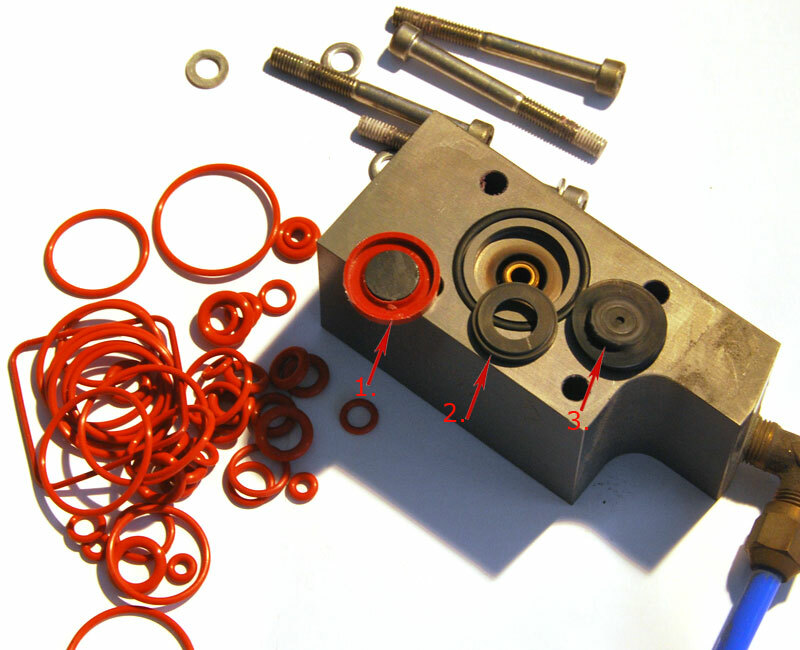 The spring didn't slide as smooth as it should it the plastic housing so the spring force couldn't manage to push the push-button out again when depressed. or reconditioned as described above it is now time to put it together again. to help to delay it. Now put the push-button together again. This is the prolouge to the actual review that can be found here! (However it is still worth it). The Faultmate MSV-2 Exreme powered up and waiting for instructions. 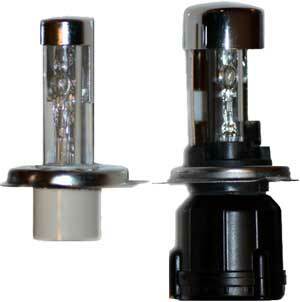 HID Xenon upgrade Kit's has become very cheap those days I bought two of them. 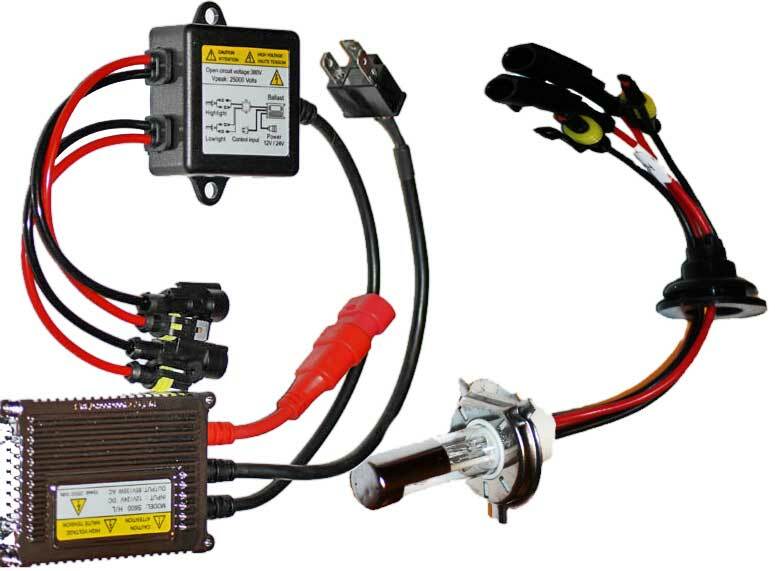 Best places to get the HID kit's at a nice price is Amazon.com or Ebay . 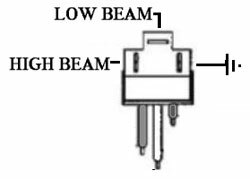 point for respectively HIGH/LOW beam use. to me than a bulb with moving mechanical parts. such problems in one way or another. Like a good customer I first followed the hook-up instructions that came with my kit. electrical system with 100 usless watts, thats almost 10 Amp!!! 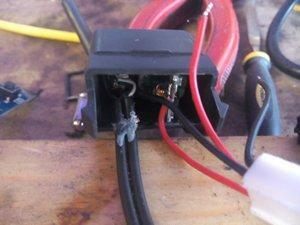 So I decided to try another way of wiring it and it worked just fine, I will now show you how I did it. my kit. 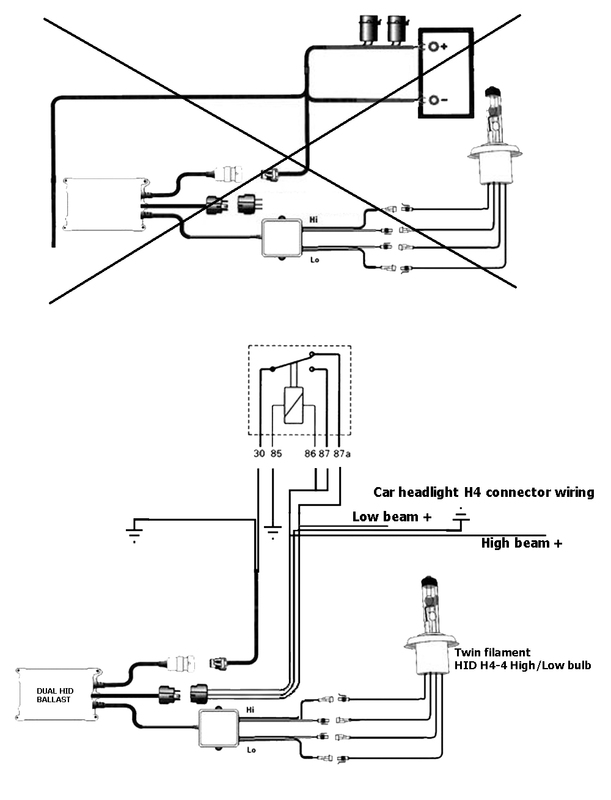 I wired my Rangie exactly like that and came out with the "Bulb failure"
rather than just using them to control the lights (Like in the upper schematics). Hooked up like this everything works just fine and no signs of bulb failure warnings. or ballast ends it's life. 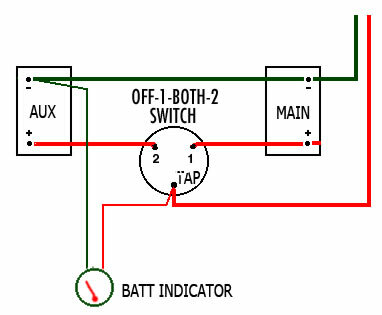 Layout of the switching relay. element in the dual HID bulb, no moving parts involved. the driving light part of the headligt that normaly is equiped with a H1 55w bulb. Everything worked at once, no bulb warning no hazzle. in the lamp dust cap thats all! the work bench I decided to replace the sidelight with LED lamps. to replace a G10 socket 5W Halogen bulb. Led bulb advertised to be Warm white. circuit and crossed my fingers, did it light up? YES! Any solution to the bulb warning problem? respects better than the P38 but sertenely not in all aspects. 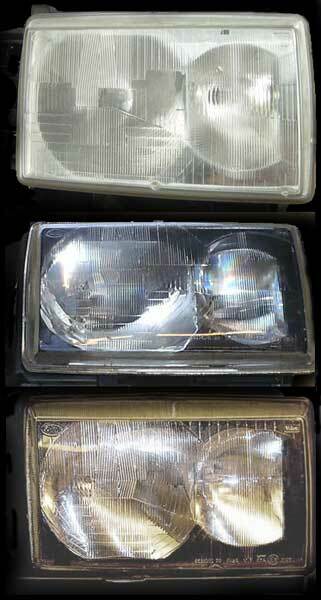 to replace the older chrome style headlights that was standard in the -99 Rangie. kit installation that you can read about at a nother place on this page. to take the glass of and modify them to look like the post 2000 black trim headlights. Did I have any success with my atempt? - Yes! Did I learn anything that you can learn from? - Yes! edges until I got hang of it! when you reassemble the headlight unit). edges of the old sealant. 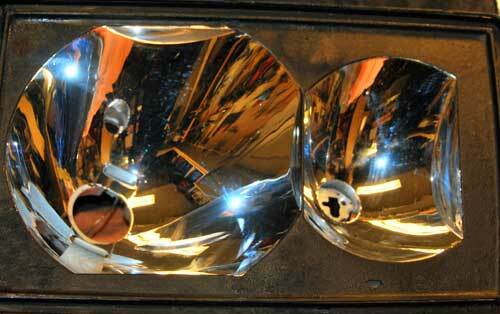 My reflectors, black mask painted and ready for re-assembling. of the reflector flat black. get a velvet like finish. that suppose to stay shiny .......don't do that (learn from my mistake AGAIN!). The chrome plating came off when I removed the masking tape :0! so no damage caused to any important part of my reflectors. 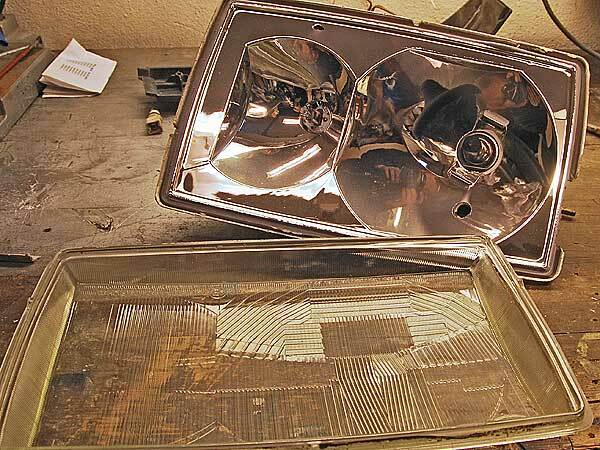 My headlight unit after surgery. I used aluminum tape to hold the sealant in place until it was cured. 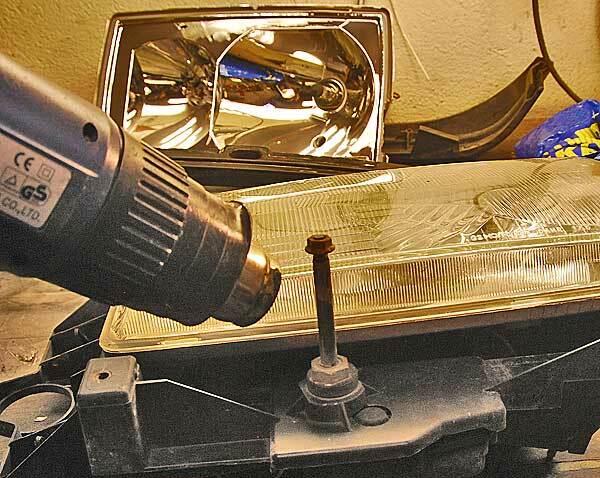 be careful if you need to clean it since the reflector coating is delicate and easy to damage . the fuel consumption down would be wellcome. a bit it would be welcome. of the things I tried with success was a new type of spark plugs. At least they where new to me in 1999, the HALO sparkplug's by Brisk. 150 000Km change intervals and that alone was a reason to try them. 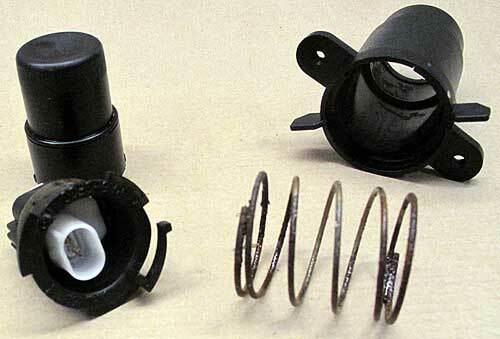 Halo plugs compared to the standard plugs the suppose to replace. can ither be done automaticly/adaptive by the ECU or manually. share with igniters that are used in aircraft turbine engines. compared to a new one! 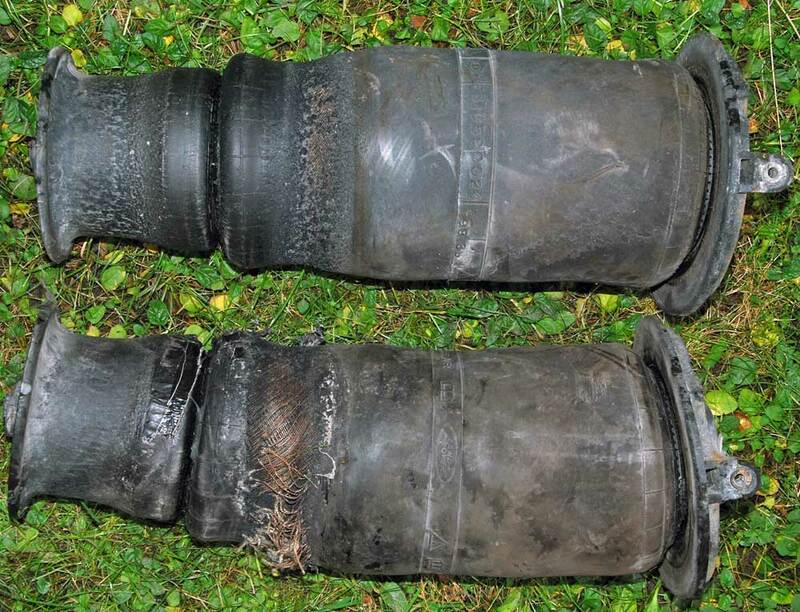 showed to be an air leak. 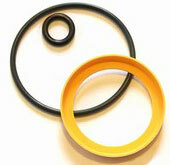 the extended life period of the Halo plugs. the look of my engine bay! 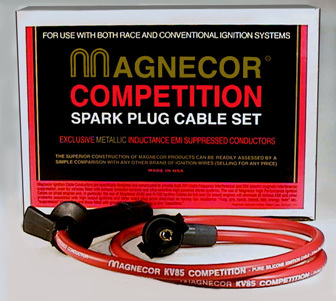 price o earth on the Magnecore leads. ignition setup and keep reporting my impressions over time of use. the impression of better response on acceleration but that I'm not sure of. Yes I know and I agree with you, I bought this stuff and of course every time you spend a bit of time with your car in the garage if only to change the engine oil you feel that the car runs much better but still it idles smooooth right now! 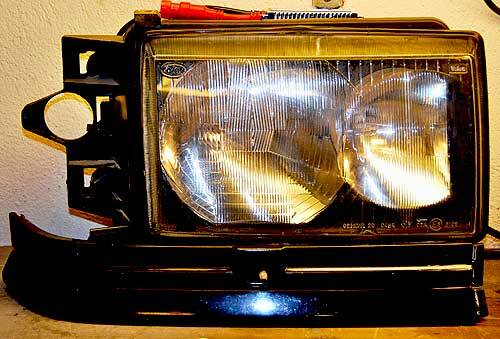 The most common and annoying Range Rover P38 problem, the HEVAC. how I solved my problem with this system. My HEVAC problem is now solved it started and ended up like this. One sunny day the darn book and question mark showed there ugly faces. dealer for service and a chance to get rid of some cash. For me it means trouble, work and a challenge! trouble started and how it was solved. 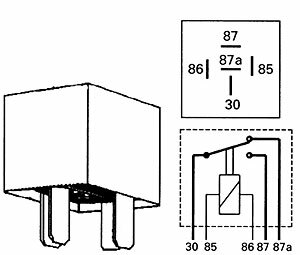 suggestion to do fault isolation on the blend servos or distribution/blend motors. much about the A/C not working, BUT BUT now things started to get wierd. to reach freezing temperatures inside, I can assure you it wasn't pleasant! A/C compressor never cut out and the tubes by the compressor iced up heavily. the air flow in the HEVAC system completely (There was no flow att all from the outlets). I had no time to continue the fault isolation during this tour witch was a pain. from the holy internet and partly from my new toy the Faultmate. This is wat I found out. implemented a fault in to the system by shimming the clutch to tight. the clutch, when I did the compressor was still driven! didn't deliver cold air in the summer because of low pressure/gas level in the system. allow the clutch to engage. led me to the HEVAC control unit. the inaccurate shimmed clutch that fouled me. by itself after a few or more minutes of driving. cause to wy the HEVAC control panel nead some time to get awake hmm mm..
car equipped with heated seats. Turns out that the climate control measures the current on the compressor control line. That's how it can tell if there is an open or a short. Climate controls for PRE-98 control the compressor clutch directly. No relay. 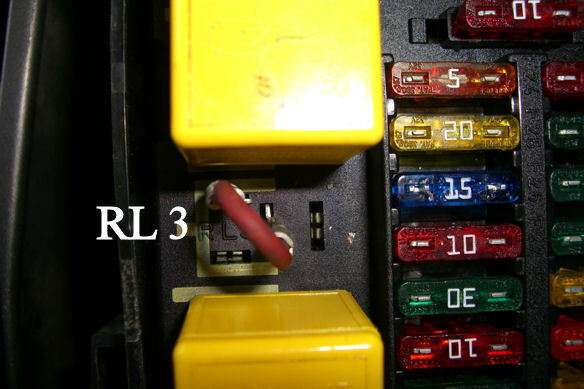 (RL 3). The climate control used in 1998 to 2002 use a relay to control the clutch. 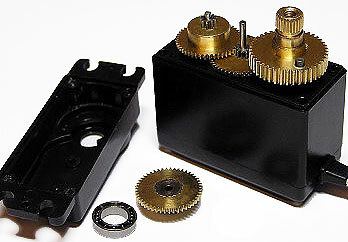 The relay uses much less current to control. around RL-3. It will then work. See picture. powered by 12v from other than the climate control line. 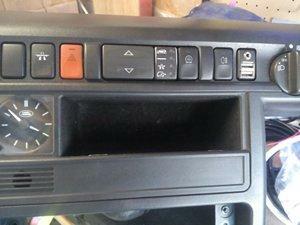 In conclusion, it's best to get the correct climate control unit for your year model. But, you can make any of them work. My comment to this hack is..
powers the magnetic clutch directly. voltage drop, and still be able to use the older type control panel. 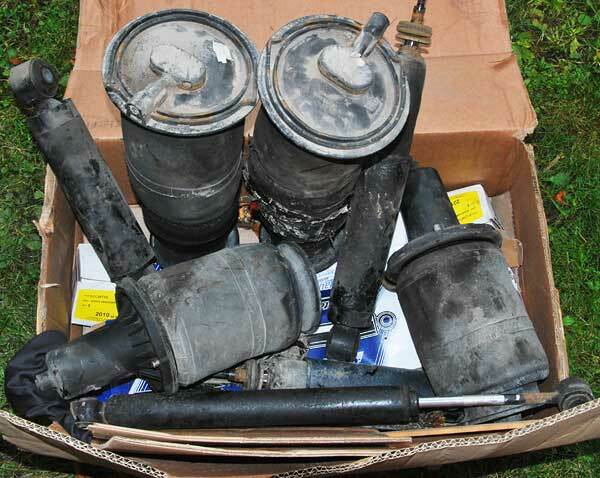 The blend motors are another common source of failure in this system. 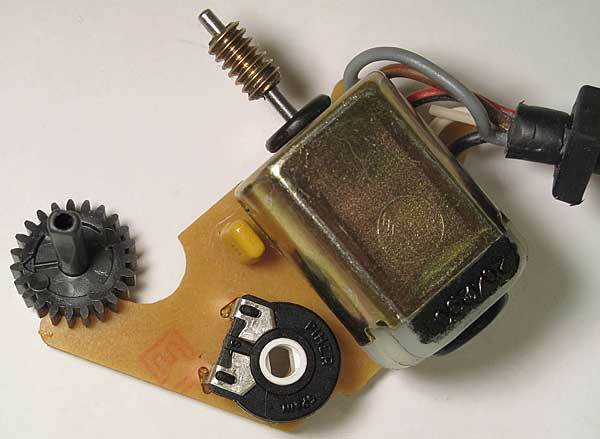 circuit board that holds the motor and potentiometer. value without any large jumps. 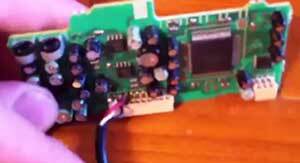 Use a 12v DC source to check the DC motor and make sure it spins fine. motor anchor is OK also change polarity to reverse direction a few times "just in case". between motor and HEVAC control panel. 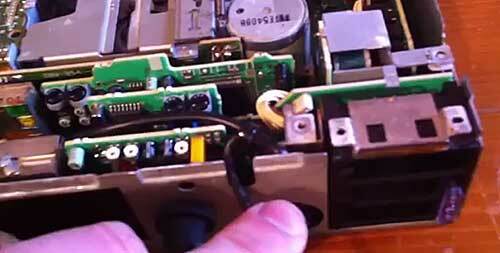 In case of faulty potentiometer, unsolder the potentiometer and replace it. 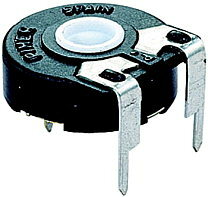 It is a 10K linear trim potentiometer PHIER PT 15NV is the type. if you intend to replace yours . units that only lasted for 2 month until they started to misbehave! 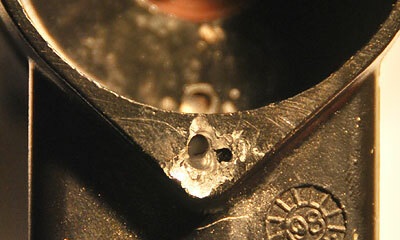 solder joint at the position feedback potentiometers. to the potentiometer, the white one is for the wiper. 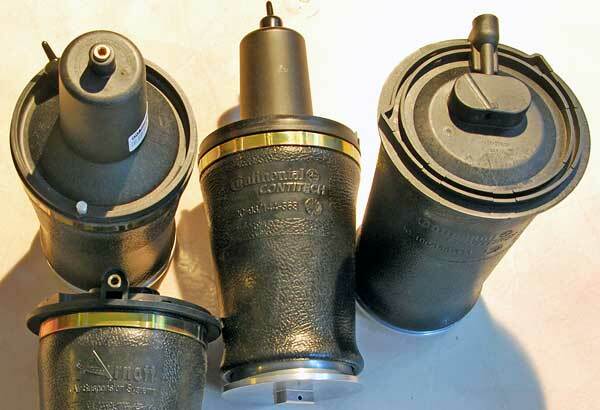 The other two are for the DC motor (brown and black). 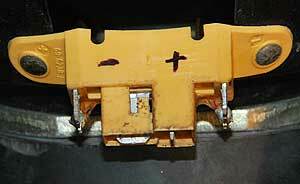 remove it and splice it back in when overhauled. 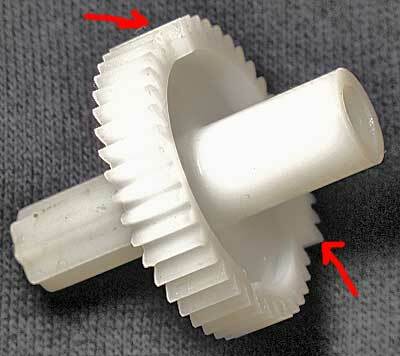 markings on the big white gear to meet the marking on the potentiometer gear. 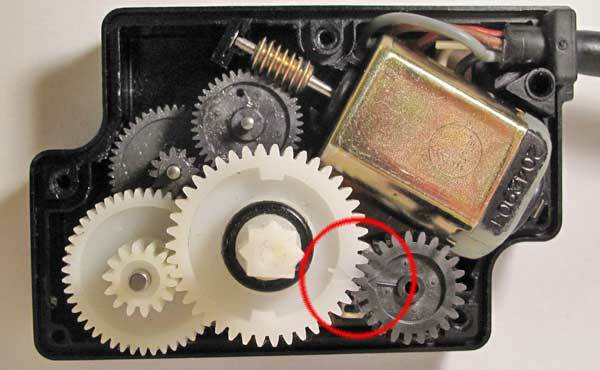 install the potentiometer feedback gear without taking care about markings. arc shape. Also carefully and slightly adjust the springs. and thereafter with pure alcohol to remove grease. 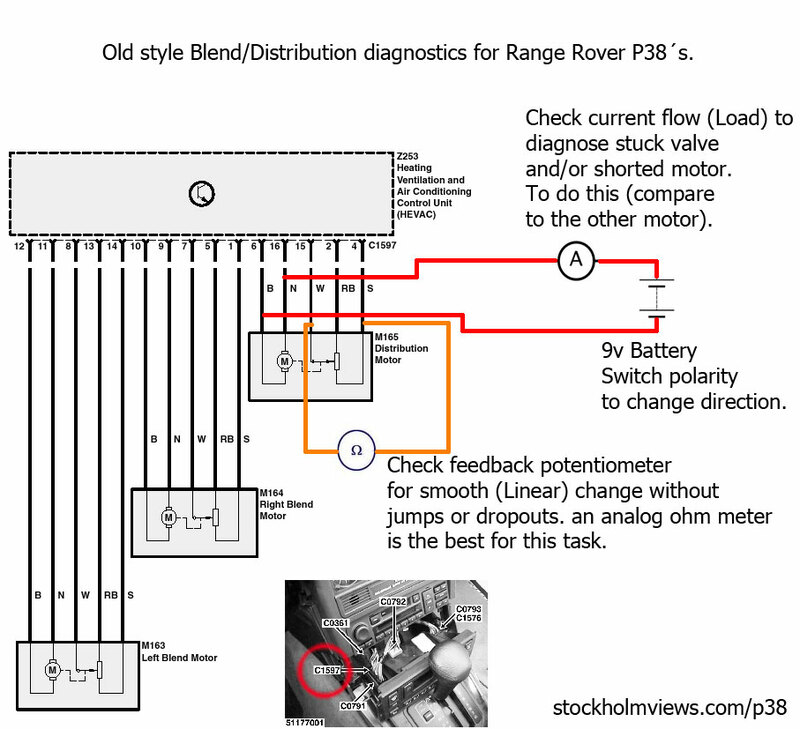 The image above shows an example of how you can perform a health check of the Range Rover P38´s blend and distribution servo motors with some simple electronic instruments. 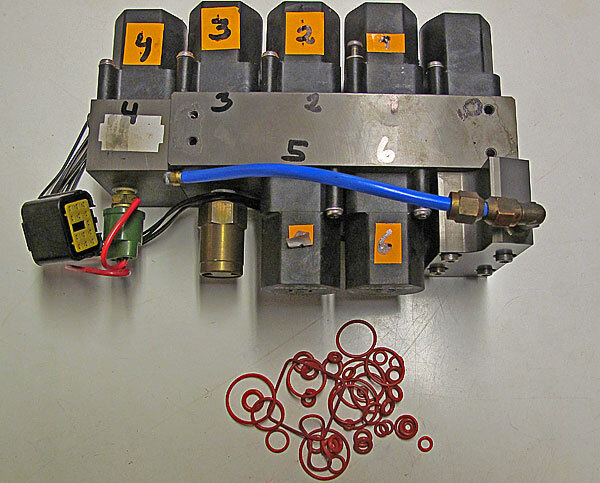 To get access to the blend/distribution motor connector you need to remove the HEVAC control panel (Find out how in the RAVE manual). 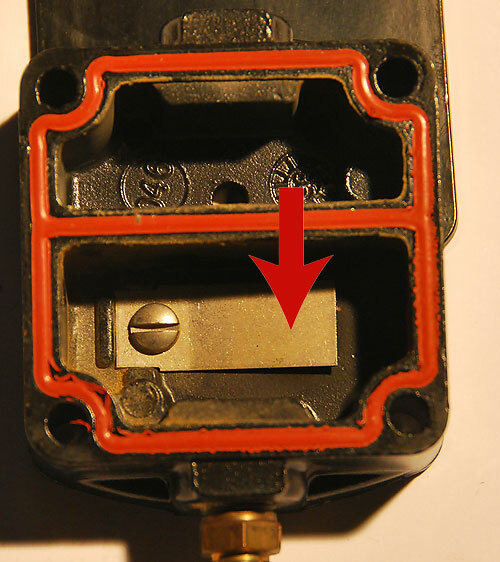 On the actual connector you can now find markings for pin 1 and 16 (molded in the plastic connector body) and you can start to find the hook up points for the motor assembly that you want to diagnose. 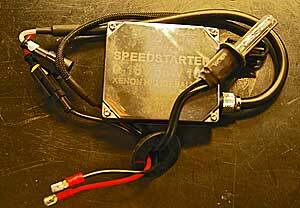 To start with you can run the motor in both directions to find out if it can move at all. 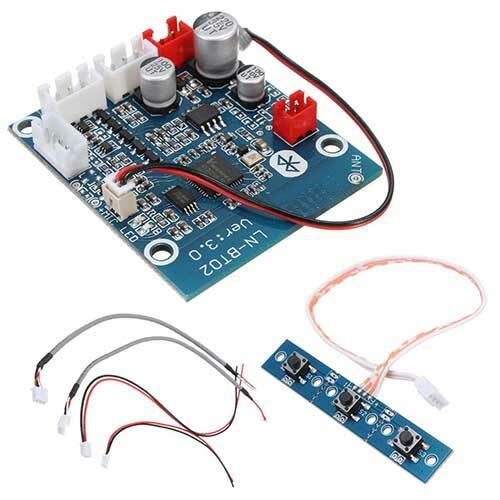 You can monitor the movement by measuring the resistance (Ohm) of the position feedback potentiometer at the same time as you run the motor from a 9v battery (Or other power source 9-12v) change direction as son as you reach the mechanical end stop*. Measuring the current load (Ampere) will help you to find out if the valve is sticky or hard to move since when the motor get loaded by high friction or get stuck the current will increase. 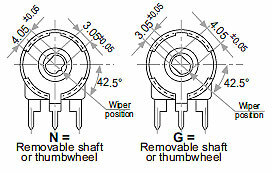 The position feedback potentiometer can also be checked this way in this example (The Dist motor) first measure the value between pin 2 and 4 it should be 10khom then put the ohm meter between pin 2 (or 4) and pin 15 then run the motor several times from end to end by shifting the polarity of the power source at pin 6 and 16 at the same time as you monitor the ohm meter, make sure the value changes smoothly without jumps or dropouts. 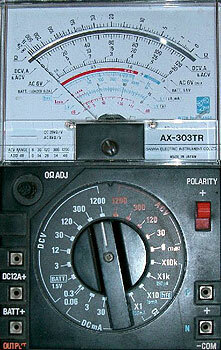 An analogue ohm meter with dial and arm is best for this task since it is easier to monitor. So what should the values read then? The easy answer is there are 3 identical units in the P38 so just simply measure the other once to and compare with them that works! Best for precise reading of values and in this case current (Motor load). 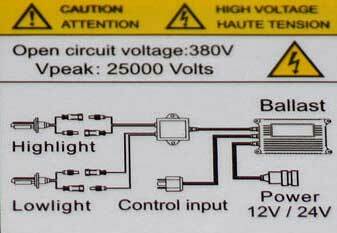 Best for reading of smooth changes of the measured value like the potentiometer value of the feedback circuit. *A small WARNING! 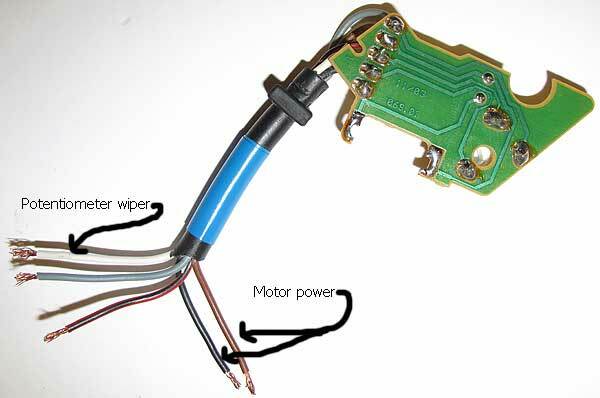 when you run the servo motor directly from a power source this way you will run it against a mechanical stop at the end, keep your attention on this and remove the power source as son as you reach the mechanical stop or you might damage the motor! to consider other options to the stock servo blender motors. built quality than the RR blend motors! 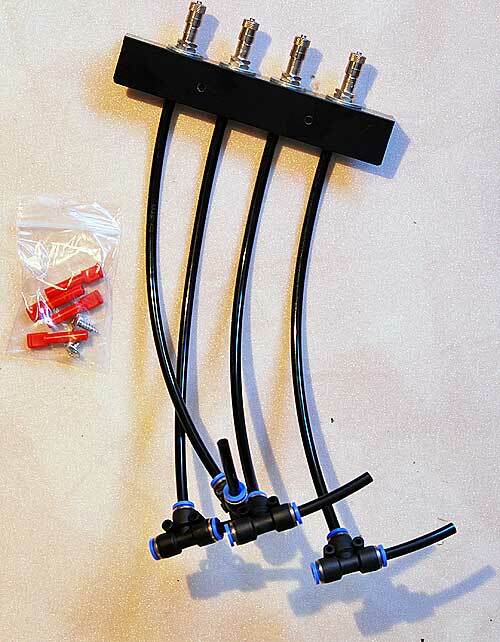 30 usd including free world wide shipping was what I paid for those four servos. 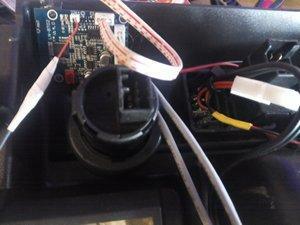 drive the MG995 servo directly or if I have to make some modifications. for the servo so that it fits the blend motor mount point. Keep an eye on this space for future updates! convenient way to buy spares for the P38. on my way back home from work I got that damn "Slow 35mph and EAS symbol"
except for the fact that the height of the car become static. When I checked the fuses I found one of the fuses for the EAS system was blown. the use of a multimeter I found the valve block driver to be shorted. I got a new valve block driver from the amazing Ebay and it worked just great again. and that we where 900km from home base. closed") and get the EAS compressor running again. leaks, I found the problem almost at once. probably at the time I bought the car but I did' t so I learned the hard way. on my car looks quite alright! You can spot traces of my war repair, duct tape and rubber sealant. just to be able to bring the car back to home base Stockholm for a proper repair. and then I headed back to the cabin for Range Rover p38 surgery. in place over the hole and not blow away. the area around it, no reason to be shy I thought so I used the whole tube of sealant. it in place, the duct tape also helps to reinforce the repair and to protect it from wear. passed I held my breath and made a test. bump stops again, I then left the highway in to a smaller road so I could stop the car. there but the compressor managed to keep it level for the rest of the journey. When I came home I ordered some parts for my car for repair and for upgrading. 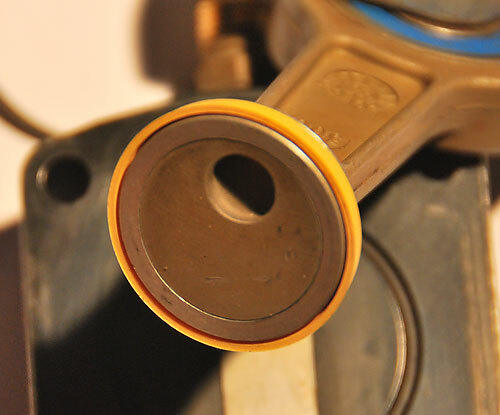 Read here about how to replace air springs and dampers. arc liners and wheels back again. 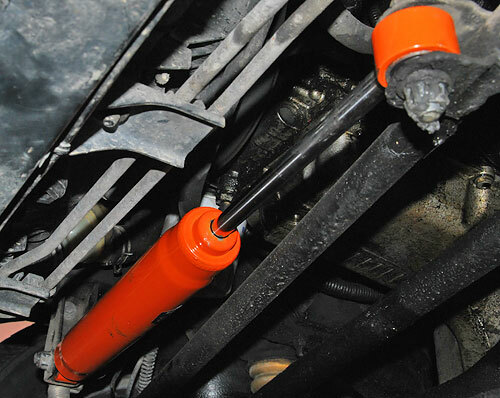 Ref:http://webcat-services.zf.com The BOGE dampers are good quality at a nice price. ability to improve the Range Rover road handling read this like "Stiff". around the corners but a car that should have a smoooooth and almost fluent ride. tired of his Bilstein's and reverted back to originals to get the comfort back! 18 and 17mm ring ratchet wrenches (Saves time and 18mm isn't in every ones toolbox). Some regular tools like screwdrivers etc. A set of garage stands (For your safety). A extra long needle nose pliers (It is hard to get to the aft air spring airline connectors without). Good movable light source (It is dark down under). A crowbar (Old bags at the back end of my car had to be convinced to get out). Mr Murphy might be there! exhaust port so now it is time for surgery of the valve block! My advice is to replace it before you wear out the compressor. here, cracked membrane all the other seals pristine. inconvenient time and place I had to bring my RR to home base. high temp plastic probably PTFE. and one with a larger diameter. of a screw that didn't cooperate! threads for a new screw. owner with a normal portion of handyman in himself would be able to perform. EAS Emergency airing system installation. of a compressor or electronic failure in the EAS system. 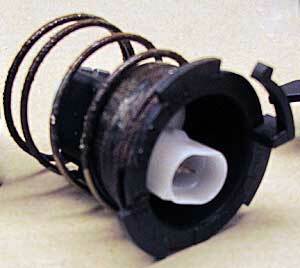 spring from the valve block. valve block diaphragm valve that have cracked and started to leak. An easy thing to repair but a bit time consuming, find out how to do it here. A few more things in regards of EAS system fault isolation. their badge and name on this lousy sounding speaker system! I might reconsider and perform further upgrades in the future. This was what I found inside the front doors of my P38! 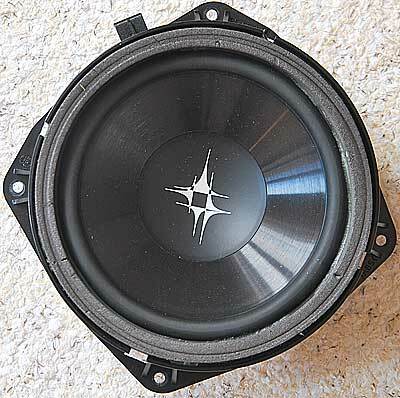 two in the sub woofer. to try to upgrade it. 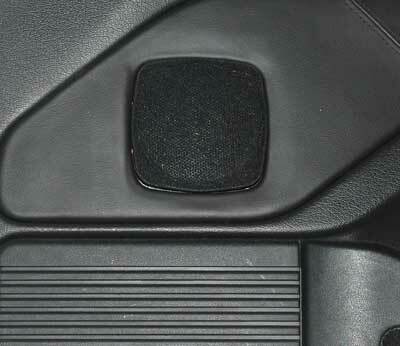 keep the original HK door amps and the original Alpine head- unit. woofer is a drop in fit. present but that's not a big issue. fit. If you like it is even possible to keep the original look. 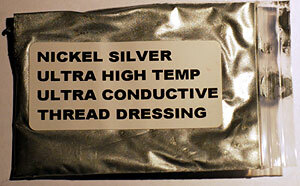 a single low quality catalytic capacitor. 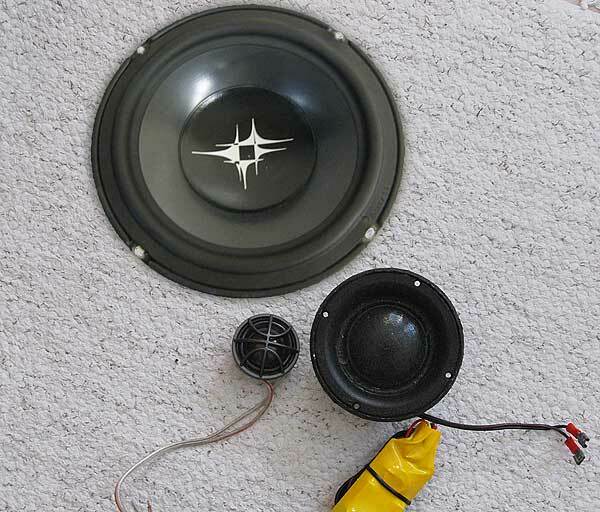 passive x-over for the new DLS tweeter that was in the box when I bought it. information that is covered by the tweeter that does that job better. 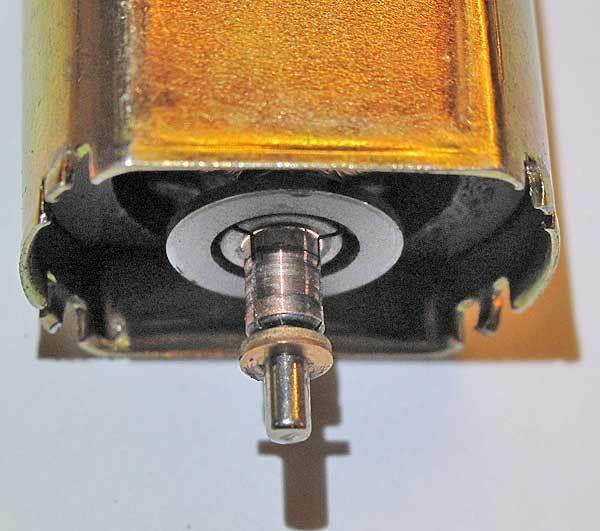 4 screws that hold the speaker assembly to the door. 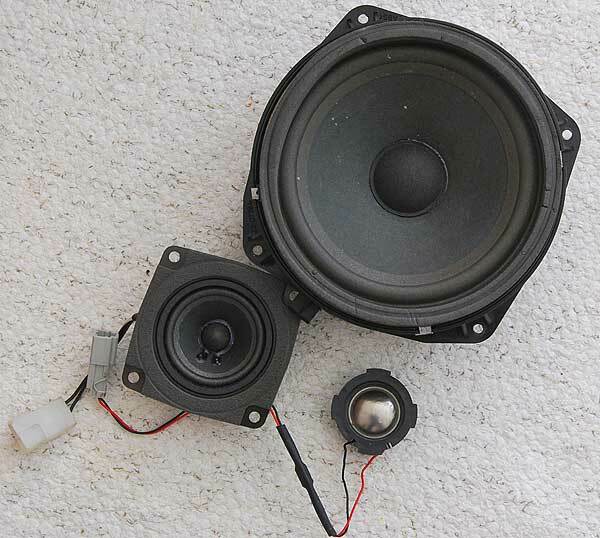 it, Some force must be used to do this since the speaker also seams to be additionally attached with a small amount of glue. 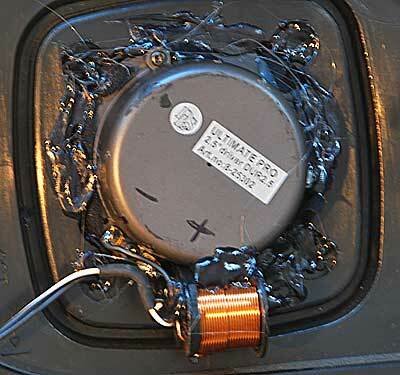 about 168mm) Use silicone sealant and/or self tapering screws to attach the new unit. Now use some contact cement to reattach the foam seal previously removed. Unit is now ready for installation. same way as the old ones. 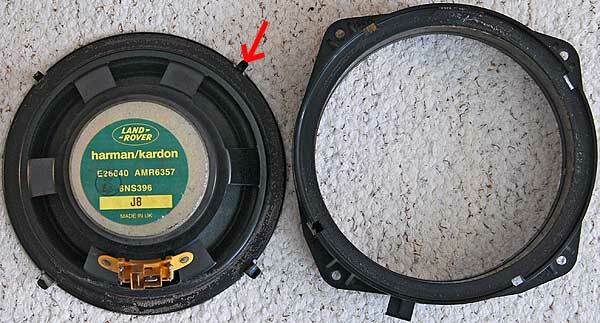 Polarity of the original door woofers. A crappy photo of a nice midrange unit. 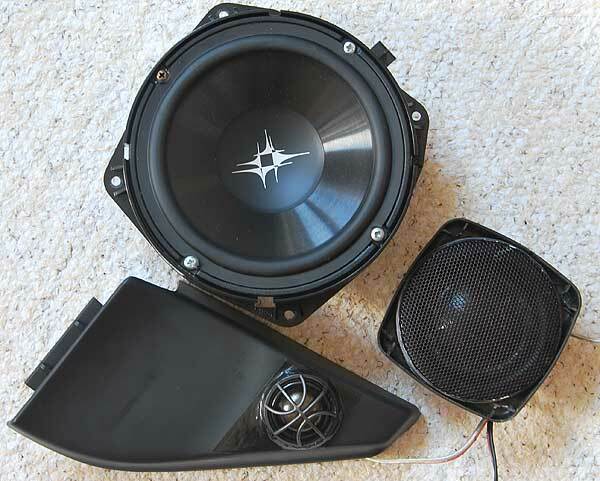 2,5" dome midrange from DLS "UR2,5 midrange with chamber"
1" dome tweeter from DLS UP1C with crossover included. 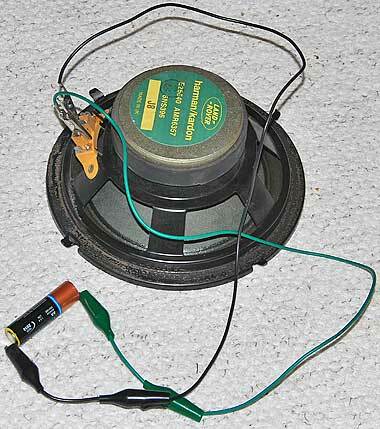 Voice coil	52 mm / 2"
3.5mm jack lead extension (cut off the socket end). 3.5mm faceplate. 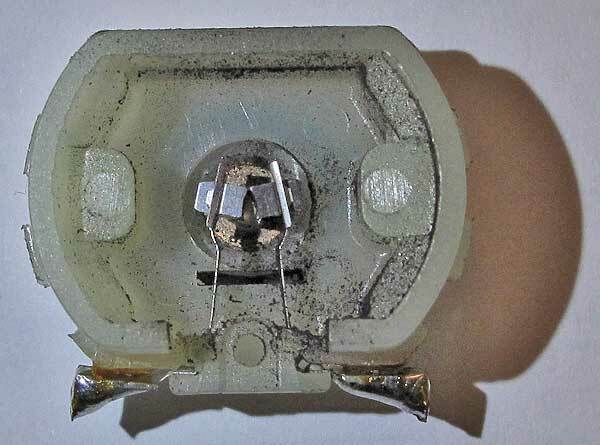 Unscrew socket from faceplate, dispose faceplate. 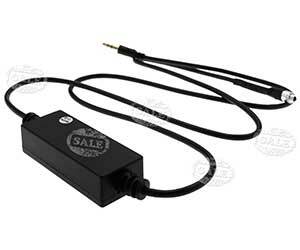 The original Aux-In lead is simple to do if you know how to solder and adds that all important Aux-In for modern equipment. 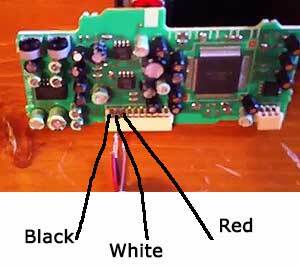 Basically all that is needed is to remove the stereo, remove the top cover and locate the 3rd board as in the picture below. Once the mini board is removed solder the three wires from your audio jack lead to left three pins on the left hand connection block. Completed wiring looks like this. Now pop the modified board back in and route the wire out the back making sure to place a loop or tiewrap inside the radio to act as strain protection. That's it difficult bit over. Take the faceplate and unscrew the jack socket from it. Discard the faceplate, bin it, save it, do what you like with it but it is no longer needed for this project. Put this to one side. Get your USB Adapter and take the apart. I used a dremel to lightly go around the edge and pull the two halves apart. 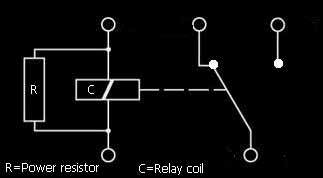 Unsolder the spring which is the + and the side contact, the -. I used a old plug and socket from a R/C model battery to act as a connection and ran the 12v wires down to the cigeratte lighter and used some basic scotch locks. Use the blank switch (right one next to the light switch on diesels is ideal, otherwise the far left one will do), dremel and file the bottom half of the of the switch blank and drill a hole for the Aux-In at the top half. Pop back into the vehicle and connect the Aux-In lead into the ex faceplate socket. (or via the filter if required due to noise). You now have an easy to remove socket in the blank switch. 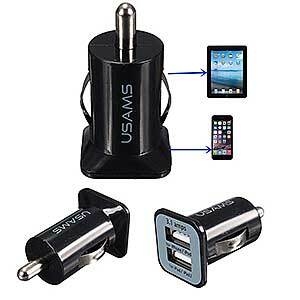 whenever a device is plugged into the Aux-In the radio will cut out and the sound will come out the radio. 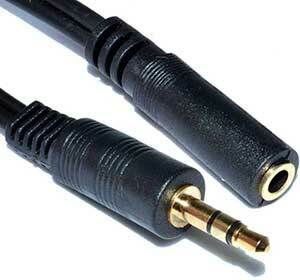 Another 3.5mm jack extension lead. 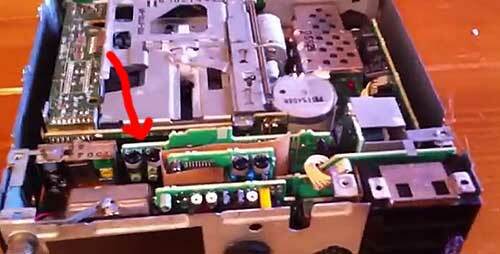 Remove your USB / Aux-In blank switch panel which was created above. Cut your 3.5mm jack extension lead in half and tin the ends of both halves. 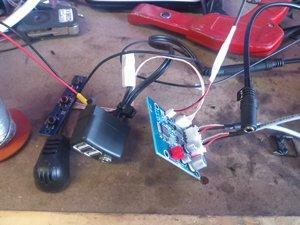 The Jack plug needs to be soldered onto the Aux-In lead on the Bluetooth module. The Jack socket needs to be soldered onto the Audio-Out on the Bluetooth module. 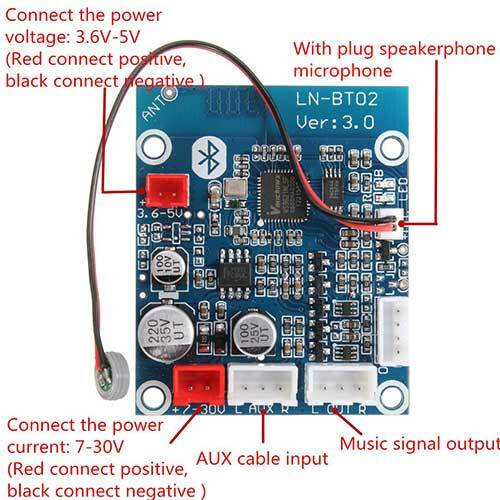 There are 2 x power cables on the Bluetooth Module, you can ignore the 3.6-5v lead but you will need to connect the 7-30v lead to the power cable used for the USB adapter you created in the Aux-In steps above. The Bluetooth module does come with a microphone but I opted to use an old car kit microphone instead purely for cosmetic reason. My cable looks like this. I removed the centre dash and hot glued the bluetooth board to the position just above the back of the lightswitch. 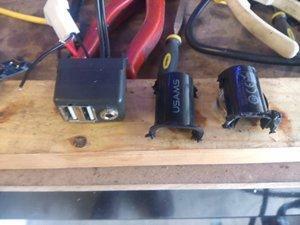 Once the power connection has been made, connect the Jack Plug on the Bluetooth module Aux-In to the old faceplate jack socket now in the blank switch (your Aux-In device connection). I placed the mic and switches on the top of the centre console for now although I do plan on mounting underneath in the future and connecting 3 x push switches to the convenient solder pads on the switch board. Replace the dash and while doing so plug the Bluetooth module Audio Out Jack socket and radio Aux-In lead together (or to the audio filter if required and from the filter to the radio Aux-In lead). Plug in the power and now to test. I'm using a tablet connected to the Aux-In via a lead and the audio comes through nice and crisp with no distortion. When switching on the power I also receive a notable tone via the speakers letting me know that the bluetooth module is now powered. So, my little boy is now watching his moster truck videos in car with the sound coming through the radio and the tablet is also being charged via the USB ports we have created above. 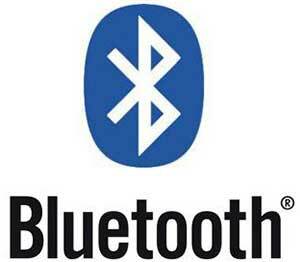 My phone can also connect via bluetooth and I have a nice clear car kit. You will need to connect for the first time, no parining code is needed. After that connection is automatic.If I receive or make a call the Aux-In tablet connection is cut off or of course if I choose to play my own music over the bluetooth connection when my boy is not in the car. I believe this has given me a wide range of options of Aux-In equipment with bluetooth 4.0 connectivity while not worrying about losing the cd changer. If nothing is connected, I hear the radio as normal. Everything is still standard and easily removed if needed. All by Mark Askew member of the Range Rover P38 group. easy to find and might be cheaper than the "LR branded part"
Future updates of this page will contain. When I get some spare time I will add more info to this page. The first things to write about will be. How to renovate the distribution motors / servos. Relays, how to troubleshoot relays in general and HEVAC related in particular. DIY A/C Gas refill and alternative cheap gases!! 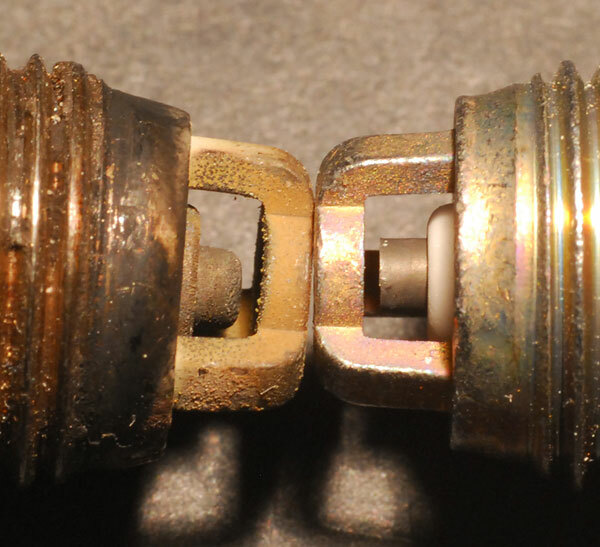 P38 Air suspension troubles and solutions/alternative solutions (Yes I have had my share of this to). Wheels rims and tires, don't make my mistakes, and if you do, how to solve them. I will also put together a list of other useful websites for P38 troubleshooting. Car Guy Garage, Inc. "Make the garage another room in your house"